I'm having so much fun playing with this product suite!! 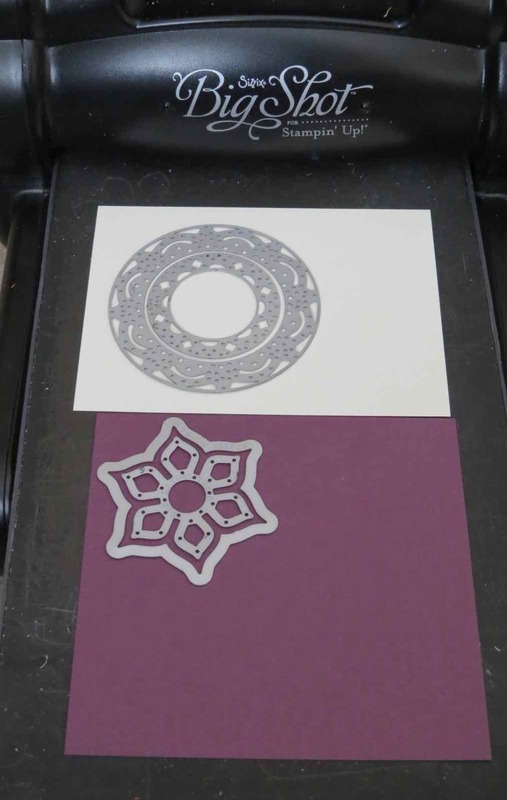 I wanted to make an easy card using the Eastern Beauty stamp set and the Eastern Medallion thinlit dies. I paired the new in-color Fresh Fig with Wisteria Wonder and Perfect Plum. The card is easy because you can lay all your thinlits down on the precision base plate and send them through the big shot. My Very Vanilla layer card stock is 4-3/4" x 3-1/2" and I layered it on 5" x 3-3/4" perfect plum card stock. I added a Metal Rimmed Pearl #138394 to the center of the Fresh Fig flower. Click this link to place a online order!